The United Nations programme that works to combat HIV/AIDS is working with the Government of Kenya in a bid to end the AIDS epidemic in the country by 2030, through the creation of a new data-collecting tool to track progress in current HIV programming. The new “Kenya HIV Situation Room” will collect data on logistics and service delivery to produce a comprehensive understanding of the scope of the epidemic, according to an announcement by the Joint UN Programme on HIV/AIDS (UNAIDS) today. “High velocity data is critical for insights into a more effective and efficient response to HIV,” said UNAIDS Executive Director Michel Sidibé. “President [Uhuru] Kenyatta’s leadership will help Africa accelerate progress towards ending the AIDS epidemic as part of the Sustainable Development Goals,” he added, referring to the new global agenda that world leaders are expected to adopt next week in New York. The Situation Room, developed by the National AIDS Control Council and the Kenyan Ministry of Health in collaboration with UNAIDS, with support from the Government of Japan, brings together data from four separate sources: the Kenya Medical Supply Agency; Kenya’s HIV estimates; the District Health Information System; and data from the National AIDS Control Council on programme implementers and service delivery. Current data shows that there are approximately 800,000 people receiving treatment for HIV/AIDS in Kenya. New HIV infections in the country have fallen by 77 per cent from their peak in 1993, and AIDS-related deaths have been reduced by 74 per cent from their peak in 2003, as access to antiretroviral treatment was scaled up. 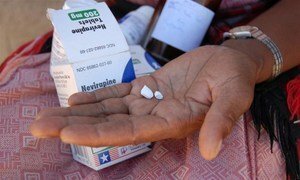 In 2014, around 57 per cent of adults living with HIV in Kenya had access to lifesaving medicines, while 67 per cent of pregnant women living with HIV had access to medicine to prevent transmission of the virus to their children. New HIV infections in children, as a result, have dropped by 70 per cent since their peak in 1994. President Kenyatta reported progress made in reaching adolescents with HIV services, and announced that Kenya would be launching a new campaign against stigma and discrimination. The United Nations programme working to combat HIV/AIDS welcomed yesterday the results of a number of recent clinical studies of the effects of antiretroviral medicines on preventing new HIV infections, which were presented at a conference on viruses held in Seattle.